Photo by me. See more here. 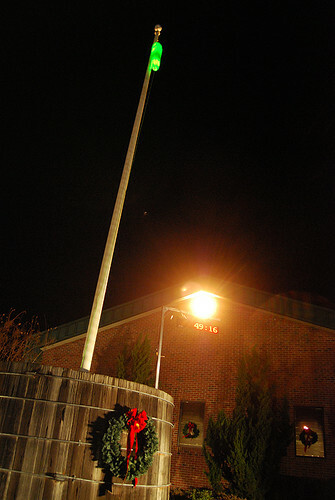 Since Mt Olive, North Carolina, location of the annual Pickle Drop, is only an hour and half from where I live, I decided to attend this small-town, family-friendly New Year's Eve event this year. Last year's event drew 2,000 people in a town with a population of less than 5,000. I also had the chance to interview Lynn Williams, Community Relations Representative of the Mt Olive Pickle Company, sponsors of the event. Mt Olive, NC Pickle Drop 2009 from Jeff Cohen on Vimeo. The Pickle Drop is based on a boast made by World War II bombardiers that they were so accurate, they could drop a bomb into a pickle barrel. And in the 1950s they were invited by Pickle Packers International to test this skill by dropping pickles off a skyscraper into barrels on the sidewalk below. This idea germinated in the minds of Mt Olive Pickle employees, and in 1999, the first Pickle Drop was held in front of 8 people. By 2001 the event was opened to the public. It occurs on company grounds at 7pm, which happens to be the stroke of midnight Greenwich Mean Time. Mt. Olive celebrated its 80th anniversary in 2006 and is the largest privately held pickle company in the U.S. They pack over 100 million jars of processed and fresh pack pickles, relishes and peppers annually. They buy over 130 million pounds of cucumbers and peppers each year in over nine states and two foreign countries. About one-third of that is purchased from independent growers in North Carolina. Each April the town of Mt Olive celebrates the NC Pickle Festival, which includes a bike ride called the Tour de Pickle. Many of the things that drop are out of the ordinary things, but many towns in Pennsylvania leverage their local corporate citizens and drop a local product. I was most intrigued by Bethlehem's dropping of a peep, a product made by the Just Born Company. I struggled to find a photo of the 25-pound fiberglass peep, because it is not featured on the web site of this year's celebration. The picture doesn't do it justice, but I am hopeful there will be a better picture forthcoming. Bethlehem is a city in eastern Pennsylvania, United States, with an estimated population of seventy thousand. It lies in Northampton and Lehigh counties. Bethlehem borders with the cities of Allentown and Easton and is part of the greater Lehigh Valley community. Just Born produces enough peeps marshmallow candies in one year to circle the earth twice. Yellow is America's best selling color of peeps chicks and bunnies. If you had 8,000 peeps bunnies, and you stood them in a straight vertical line, you could reach the top of the Sears Tower in Chicago. This holiday season, Trip Advisor put out a press release listing the 10 Quirkiest New Year's Celebrations. This release was picked up by many papers (and web sites), plus there were a few wire stories widely circulated, which were also based largely on this press release. What all this means is that this current top 10 list has pushed other results out of the top of Google searches, making other celebrations harder to find. Even though I am only further reducing the range of searches, I do feel that it is necessary to also list these 10 celebrations here. The criteria for choosing them appears to be something silly drops (which in many cases is the only quirky thing about the celebration) and someone can write a cheeky headline about it. As these celebrations happened tomorrow, I may choose to focus on these or others. I also found a new site called Ball Drop USA that has additional items to add to my master list. It turns out the acorn was removed from its pedestal and taken to the home of artist, and acorn sculptor, David Benson for a cleaning and polishing. Here's a bit of video from WRAL of the acorn scrubdown. Looking for the Acorn from Jeff Cohen on Vimeo. 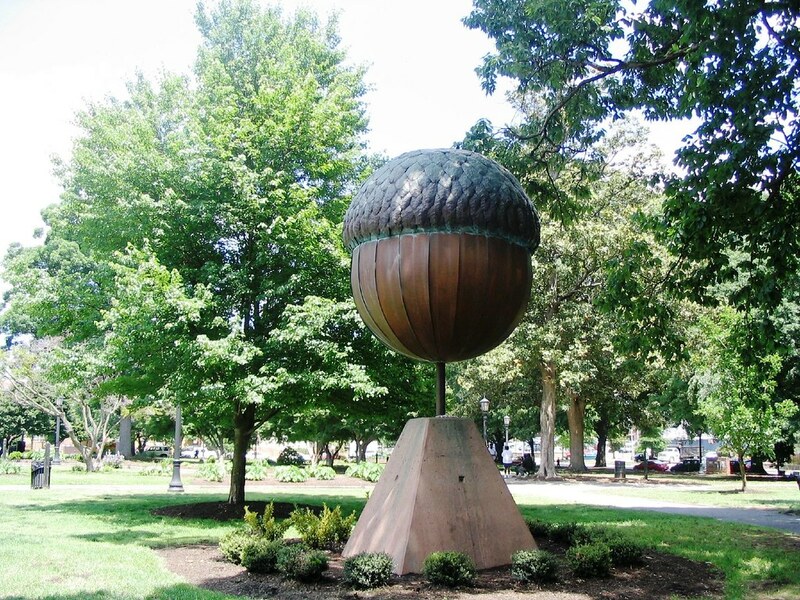 This is the normal location of Raleigh's 1250-pound bronze acorn that drops on New Year's Eve. For years I have been intrigued by the local celebrations across America where they "drop," or in many cases lower, something from above to ring in the New Year. Many of these traditions are relatively recent and are based on the ball dropping in New York's Times Square. I have been blogging about these celebrations since 2005, especially the quirky ones. I used to just stumble across them by chance, but eventually I discovered a wikipedia article that seemed to do a comprehensive job of listing them all. It also provides lots of links to the celebrations' web sites or media coverage of the events. I summarized the article in several lists, which I found interesting. Last year I registered this domain name, newyearsdrop.com, and didn't do anything with it. I think whatdrops.com, or variations of that were all taken. Well, this domain was getting ready to expire, and I wasn't going to renew it, but I got an idea. I can actually create a blog that includes my New Year's posts from each year, and features this year's celebrations. And today I saw this post on 30Threads, which featured a post from the New Raleigh blog that reveals the Trip Advisor's List of 10 Quirkiest New Year's Celebrations lists Raleigh as Number 10. I wanted to comment and share my lists and links of New Year's Drop, so this was the perfect time to create this blog (which is done). So look for more posts about individual celebrations, and maybe some surprises too. For the past two years, I have compiled posts (2006, 2007) with a list of interesting or stupid things that towns and cities across the US "drop" (or lower) from downtown buildings. These civic celebrations are based on the ball that drops in Times Square in New York. My reasons for compiling this list is because I am also influenced by Raleigh's acorn and Mt. Olive, NC's pickle. Out of 61 things listed, 30% are food, while 15% are animals. The only live animal I know about is the possum in Brasstown, NC. Many of the items are related to the town's name (Shippensburg, PA: anchor) or a town's best-known product (Hershey, PA: Hershey Kiss, Pottsville, PA: Yuengling). Geographically, the following 19 states are represented in the article, and Pennsylvania has the most drops with 36 cities and towns listed. There are many states not included. I would like your help, and your friends' help, in expanding this list. Please comment below if you know of anything else that drops, or a state not listed that has a drop. Please include a link if possible, and I can update Wikipedia. Thanks for your help and have a Happy New Year. and a long list of things from a giant red shoe carrying a drag queen (Key West, FL) to a wrench (Mechanicsburg, PA) on Wikipedia. Original Title: What Else Drops in Other Places? The latest ball measures 6 feet in diameter. The lighted Ball descends 77 feet in sixty seconds. The Ball is a geodesic sphere, six feet in diameter, weighing approximately 1,070 pounds. The Ball is covered with 504 Waterford crystal triangles, 696 multicolored Philips light bulbs, 96 high intensity strobe lights, and 90 rotating pyramid mirrors. Let me know if you know of anything else.